Summary: When a family of three from Florida gets caught in an Ohio blizzard, things go downhill pretty quickly. Unable to find their way. and exhausted from plowing through the deep snow, they finally dig a hole to take shelter and huddle together to wait out the storm. From time to time, the father stands up to whistle, hoping someone will hear this call for help. On a nearby farm, the whistle catches the sharp ears of a cattle dog, and she sets out to locate the source. Finding the family, she stays with them long enough to warm them a bit, then heads back to her farm. She drives the cattle across the snow, flattening it enough that the family is able to walk across it and at last find shelter with the old farmer who owns the dog. Many years later, the boy in the family, now 18 years old, returns to the farm to try to reconstruct the miraculous rescue. What he finds there changes the course of his life going forward. 103 pages; ages 9-13. 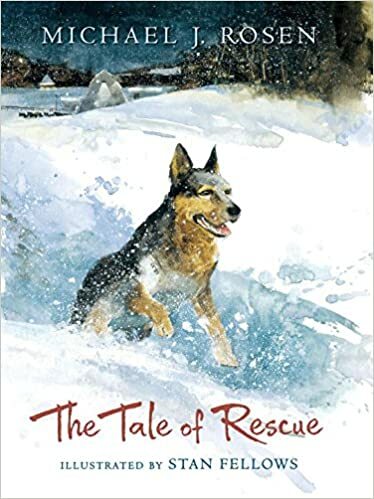 Pros: Dog fanciers will fall in love with the courageous, intelligent cattle dog, who, along with the other characters, is nameless until the very end of the story. The color illustrations perfectly capture the feel of the blinding snow and the warm farmhouse. Cons: While the short text and plentiful illustrations make this feel like an early chapter book, the vocabulary and inferencing skills needed make it more appropriate for an older audience.